These fearsome beasts have small cannons, comparable to serpentines, mounted on their backs. 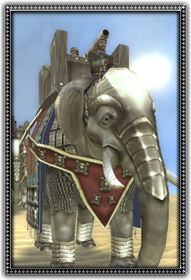 Elephants are capable of trampling men and horses into the dust, and if the elephant goes berserk that includes friendly troops as well. In such an event, the riders are equipped with a special hammer and chisel they can use on their mount's head to kill it.